Welcome to our weekly round-up of all that’s happening in London’s food and drink scene. Inside this week: Mexican, MasterChef, Maltby Street and yet more burgers. Thomasina Miers's Wahaca group now has 12 restaurants across London, but the next venture for her and business partner Mark Selby will be something different. DF/Mexico will start as a residency at Brick Lane’s Old Truman Brewery on 24 July and run for at least 18 months. Inspired by a road trip around Mexico and the States, it will serve Mexican dishes with American twists, such as tortas presented like burgers in brioche buns. London beers will have prominence on the drinks list, while a cute touch is that all diners will be given a packet of popping candy to brighten up the journey home. Word on the street is that it’s another concept which could be rolled out across town. Marcus Wareing has been announced as the new judge on MasterChef: The Professionals, replacing Michel Roux Jnr. It will no doubt bring a new level of notoriety to the chef, who learnt the ropes under Ramsay and now runs The Gilbert Scott in St Pancras, as well as his recently relaunched two-Michelin-starred flagship restaurant MARCUS in The Berkeley hotel. This weekend will see a new addition to increasingly bustling Maltby Street Market in the form of St. John Bakery Rooms. The bakery, which is an offshoot of Fergus Henderson’s original Michelin-starred St. John restaurant in Clerkenwell, already has a presence at the market, selling direct from their bakery on Druid Street. 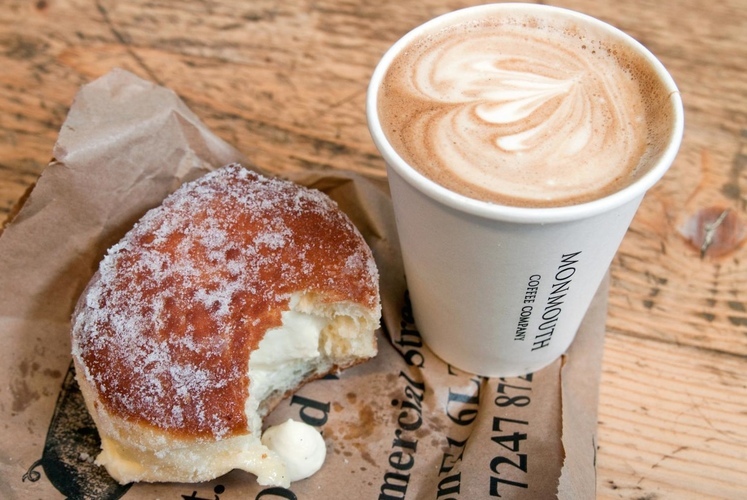 The new opening means that you’ll be able to sit down to enjoy your purchases with a cuppa or glass of wine rather than have to rush off, which is all the better for enjoying good stuff like bacon sandwiches, eccles cakes, madeleines and what are probably London’s very best doughnuts. The bar at Gordon Ramsey’s Union Street Café continues to host a series of ‘takeovers’, where brands lay on masterclasses and tastings for guests, with a portion of the menu devoted to that drink. Bulleit bourbon & rye is the brand in question this time round, with the special menu running until Sunday. Pop by tonight to get a chance to take part in a free twenty minute masterclass, or head there on Friday to soak up the transatlantic vibes at an Americana party - free entry and no need to book. It’s all happening in the E postcodes. New wine bar Verden opened in Clapton this week, focusing on lesser-known wines and grape varieties and serving charcuterie and cheeses alongside a small hot food menu. Close by, the Walthamstow-based creators of bacon jam Eat 17 have opened a restaurant above their new burger bar in Homerton. Closer to the City near Smithfield Market, restaurant and craft beer bar Ask For Janice has launched. And the final touches are being put to Merchant House near Bank: run by London Bar Consultants (the people behind the City of London Distillery Bar), it will stock more than 150 different varieties of both rum and gin. Friday will see Stax Diner open in Carnaby’s Kingly Court. Brought to us by Bea Vo (of Bea’s of Bloomsbury fame), it will feature create-your-own burgers, chicken sandwiches, po’ boy and more, plus sundaes to finish. There’s more burger action to come from Hawaiian-themed Kua Aina which will launch on Goodge Street in the autumn, while French burger chain Big Fernand will open on nearby Percy Street in October. In less bap-related news, Gordon Ramsay will open two new restaurants before the year is out. Written by Ben Norum and Janan Jay.